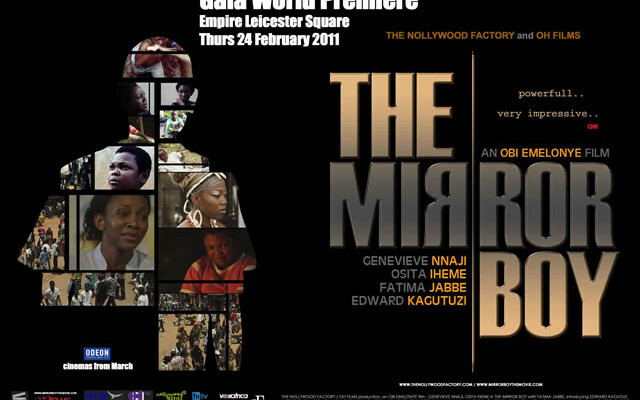 The Mirror Boy is a mystical journey through Africa, seen through the eyes of a 12 year old boy, Tijan. After a London street fight, in which a local boy is hurt, Tijan's mother decides to take him back to their roots, to Gambia. On their arrival in Banjul, Tijan encounters a strange apparition, a boy smiling at him in a mirror and vanishing. Seeing the same boy in a crowded street market the next day sets in motion a chain of events and eventually Tijan finds himself lost. While Tijan's panic-stricken mother struggles to find her son, Tijan is left alone in the company of the enigmatic Mirror Boy, seemingly only visible to him. After a bruising spiritual rite of passage, The Mirror Boy takes Tijan on a mystical journey, but all is not what it seems. Ugor, Paul Ushang. “Youth culture and the struggle for social space: The Nigerian video films.” Dissertation Abstracts International Section A 70. (2010). PsycINFO. Web. 19 Nov. 2013. Harrow, Kenneth W. Trash: African Cinema From Below. Bloomington, IN: Indiana UP, 2013. MLA International Bibliography. Web. 19 Nov. 2013.